. : Optics & Photonics Focus :: Plasmons: Transform! :. Laser diodes are the cheapest and most reliable lasers; nevertheless, they have hardly been able to emit in UV until now. This last barrier has now been broken, thus enabling potential and important applications, ranging from medicine to security issues. Ultracold atoms afford scientists incredible control over the behavior of gas particles. And near impossible physics, in the form of negative absolute temperatures, for example, ensues! Never underestimate the magic of a glowing object. Luminescent materials have fascinated mankind for centuries. This enchantment continues with novel materials that can go on glowing for days without receiving continuous power from an energy source. 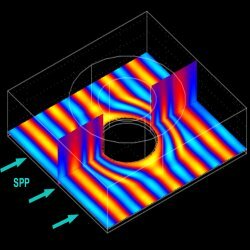 Latest experiments demonstrate an easy way to freely transform electromagnetic waves moving on metals. This yields promise of powerful applications, ranging from computers and biomedical devices, to solar cells and cell phones. Cylindrical invisibility cloak in action. 3D view of the z-component of the electric field associated with a surface plasmon at a wavelength 600nm propagating along a 50nm-high gold film and through an invisibility cloak that surrounds a metallic cylinder. The surface plasmon continues to propagate without any distortion in the field profile. Transformation optics is the mathematical tool that has opened the door of science to what, not that long ago, might have been dismissed as mere science fiction: for one, it has made possible the design of what has turned out to be the ever so popular invisibility cloak. Researchers from the Universidad Autónoma de Madrid (Madrid, Spain), CSIC-Universidad de Zaragoza (Zaragoza, Spain) and the NAS of Ukraine (Kharkov, Ukraine), have now found a way to transform a specific type of electromagnetic signals, known as surface plasmons, at will. There are many different types of waves in nature. For example, there are waves that freely propagate in space, such as sound waves, and waves which are bound to a surface, such as the water waves which occur at the interface between water and air. Cylindrical invisibility cloak design. (a) A surface plasmon-polariton (SPP) propagates along a metal-dielectric interface and scatters when it encounters a metallic cylinder. (b) Transformation optics is used to design a device capable of guiding the SPP around the cylinder. (c) This generates an invisibility cloak surrounding the metallic cylinder so that the SPP is smoothly guided around it. Surface plasmons are a specific kind of electromagnetic surface waves that occur at the interface between a metal, such as gold, and a dielectric, such as glass or air. They are currently attracting a lot of interest because they can concentrate a very high electromagnetic field at the interface and, therefore, enhance any interaction between matter and light. They have, for instance, been used as very accurate chemical and biological sensors. The fact that surface plasmons occur on metals allows us to think of them as a means to bridge electronics and photonics. For example, plasmonic nanoantennas may offer the opportunity of coupling light signals into an electronic nanocircuit, much the same way as normal antennas couple electromagnetic signals into our everyday gizmos. In order to get the most out of an electromagnetic wave it is essential to be able to manipulate it. Transformation optics is a mathematical technique that does exactly this. The idea in a nutshell is to force light to follow a desired path by modifying the electromagnetic properties of the medium in which it is moving. For example, with this technique it is possible, in some scenarios, to conceal an object that is, physically, right before us, thus making it invisible. However, transformation optics has so far only been applied to free propagating waves. 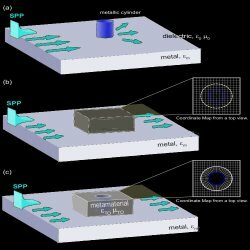 In the case of surface plasmons, which propagate at the interface between two media, the modification should happen in both the metal and the dielectric. However, the subwavelength control on the metal properties required for the practical implementation of the prescriptions of transformation optics is beyond current fabrication capabilities. This has been a major obstacle. Francisco Javier García Vidal from the Universidad Autónoma de Madrid and his colleagues have now succeeded in finding a solution: optimal control on the surface plasmons can be achieved only by manipulating the dielectric, thus making the task a lot easier from a practical point of view. The new approach is simple and robust enough to be used for technological applications while still remaining a very general tool. "In contrast to the other approaches," García Vidal explains, "we introduce a technique that can be used for any specific purpose." For example, several groups are currently working on applications on sensors, solar cells and photonic circuits. "One of the devices we are working on," García Vidal says, "is a concentrator for surface plasmons. The idea is to concentrate all the energy carried by a 2D surface plasmon into a very tiny spot. This could be, for example, used for sensing (chemical or biological) applications." The biggest advantage, says Stefan Maier at Imperial College London, is that this provides us with a general tool with which to modify surface plasmon propagation according to our needs, only requiring modifications in the sole dielectric, since the manipulation of the metal will only make sense when we have better metals, meaning metals that do not attenuate the signal very strongly. "Numerous applications," continues Maier, "could benefit from devices conceived and experimentally realized using the method suggested by García Vidal and colleagues in their paper." GA is a PhD student with the Optoelectronics Research Centre at the University of Southampton (UK). Paloma A. Huidobro, Maxim L. Nesterov, Luis Martín-Moreno & Francisco J. García-Vidal, Transformation Optics for Plasmonics, Nanoletters (2010) 10, 1985–1990 (link).